This is a fruit fly embryo. The top is the dorsal view (looking down on it), the bottom is the ventral view (looking up from beneath). Each circle is one cell of the embryo. The little lines extending from each cell, or tails, show where the cell is headed. 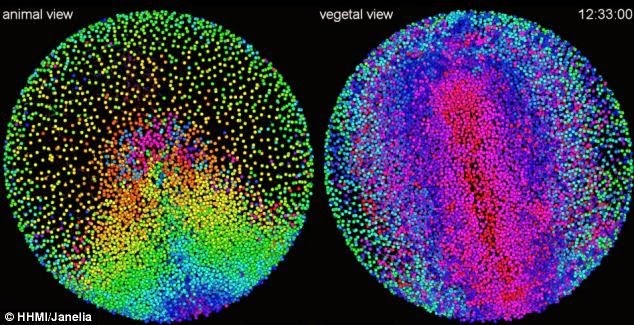 This animation tracks individual cells in an animal as it grows. The little dots that you see in the animation are individual cells. The more they know about how cells develop and move around into position within the animal, the more understanding it will give them of a cure if something goes wrong. This is particularly true for development of the nervous system. 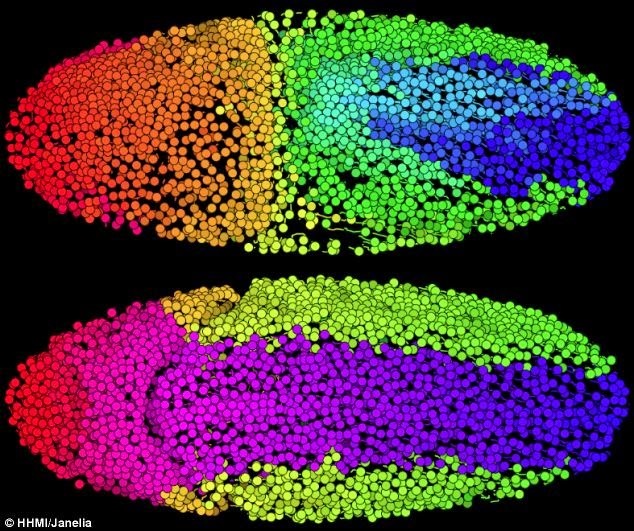 Developing animal cells are shaped according to their ultimate function and location. A group of nervous system cells may develop in a particular spot, for instance, and then move into an elongated pattern to form, say, the spinal cord. It requires high-speed fluorescent microscopy to follow the movement of cells from their origin to their ultimate destination. By taking pictures at the shortest possible intervals, the scientists can track their movement over time. This also helps to show if the individual cells divided and, if so, where. The whole development process takes time. A mouse, for instance, will start developing nervous system cells and then they will move around for a week, like a football team moving from the huddle to the line of scrimmage. Then, at a certain point, it snaps into action. This takes different lengths of time in different organisms. It would take a day in a fruit fly, much longer in a human being.